As the Amazon Kindle Fire tablet and the Digiland DL718M have shown us, in late 2015 $50 can buy you a lot of tablet. Those two tablets are better than a lot of the tablets that debuted at the $99 price point in the past year, and they offer the perfect balance of cost versus performance. 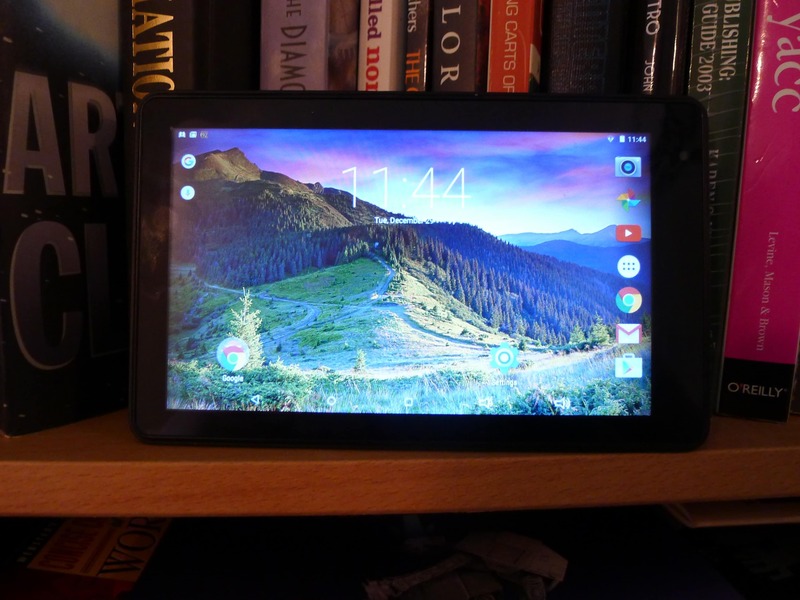 They are not, however, the cheapest tablets on the market, and that raises the question of whether one can make a $40 tablet, or a $35 tablet, and still have a device worth using. Which brings me to the RCA Voyager II Android tablet. This is one of the generic Chinese-made Android tablets that Venturer Electronics has been selling under the RCA trademark. Based on the Amazon reviews, this tablet was released at the beginning of 2015. It has slowly dropped in price since then, and can now be bought from the Walmart website for $35. And if not for the problem with storage, it would be a good value at that price. The Voyager II is your basic black tablet with a cheap looking and feeling shell. All of the ports, card slot, and camera are clustered on the short end to the right of the screen, and there's a single speaker on the rear of the shell. This tablet runs Android 5.0 Lollipop on a quad-core 1.3GHz CPU with a GPU, 1GB RAM, a 2MP camera, and a problematic amount of storage. In terms of connectivity it has Wifi and Bluetooth, and its 7" screen has a resolution of 1024 x 600. When I say this is a cheap-feeling tablet, I'm not exaggerating. No one buys a $50 tablet and expects great quality, but the Voyager II feels more like a gadget from a dollar store; the plastic is that cheap. And yes, this is an issue because the cheap plastic negatively impacts the sound quality. The single speaker can get nicely loud (this is not true for all cheap tablets) but when you play a Youtube video at or near full volume the shell tends to start buzzing. And you are more likely to stream a video than play a local file, because there's a problem with the storage. The spec sheet claims that the Voyager II ships with 8GB of storage, but in reality this tablet only has 3.3GB of storage you can use. It also has a card slot, so this normally would not be an issue, but there's also a second storage limitation. Most of that 3.3GB cannot be used to install apps (and no, you can't move apps to the microSD card). I discovered this issue when I was trying to download Antutu so I could test the tablet's performance. That benchmarking app required a second app to test the 3D graphics, and I could not install the second app because I didn't have 80MB to spare. And even after carefully deleting apps I'm not using, I'm still running out of space for apps. The screen met my expectations. It wasn't a great screen, or even a good one, but for a $50 tablet it was acceptable. The color quality was good, and the screen resolution equal to the screen on the $50 Fire tablet (1024 x 600). The viewing angles were narrow, but that was to be expected. There's a single front-facing camera. According to the spec sheet, the resolution is 1MB, but I tested it and was taking 2MB photos. The photos were pretty good, considering the price of the tablet, and I am sure that this camera will prove useful for Skype, and for selfies. I am camera-shy, otherwise I would share the photos. In tests, the estimated battery life was a disappointing three and a half hours of video time, and the tablet also kept draining its battery when in sleep mode (I had to install a Deep Sleep app to fix this issue). 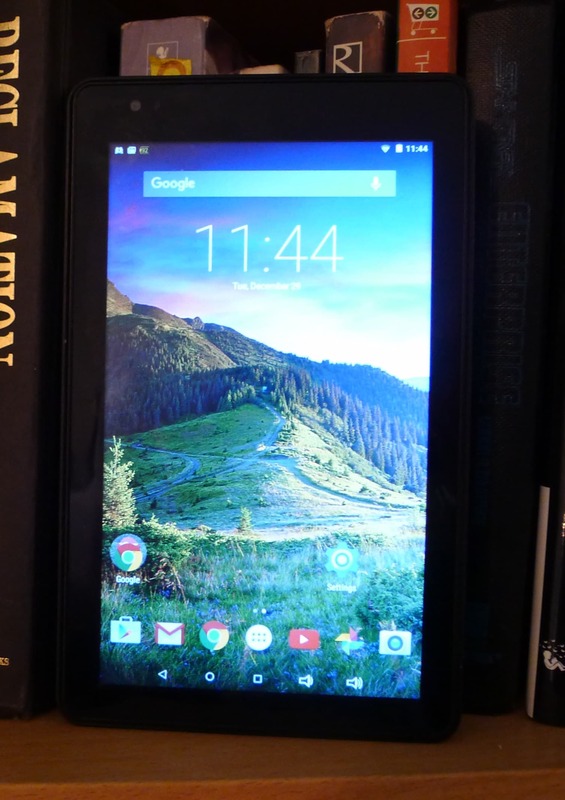 The Voyager II runs a stock version of Android 5.0 Lollipop. It's Google-certified, which means it ships with a myriad of Google Play apps. it also comes with Vudu and a Walmart shopping app. The software worked as it was supposed to, and I had no issue either with setting up the tablet or connecting it with my Google account. Aside from the problems with the hardware, I didn't have a bad experience with the tablet. I mainly used it for reading ebooks, the occasional web browsing, and testing one app at a time. It wasn't very good at watching video, but that (and the storage issue) are my only real complaints. I can't say that I was wowed by the experience, but I was generally satisfied with the Voyager II's responsiveness, feel, and the overall experience. Anyone who buys a fifty-dollar tablet expects a cheap tablet, and the Voyager II is exactly that. Cheap. If RCA could do something about the storage issue then this would not be a bad tablet. I'm not saying that it would be a good tablet, and it's certainly not my first choice for a tablet in this price range, but fixing the storage problem would seriously tempt me to give it a positive recommendation. This tablet can be had for only $35 online, and I'm willing to give it a lot of slack just because it is $15 less than the Fire tablet. But it still has the storage issue, and for me that is a pass/fail. I can't install the apps I want, and that keeps the tablet from living up to the potential of the CPU, RAM, and screen. Sure, this tablet does enough to keep the GeekDad reviewer happy, but it could do so much more if only I could install more apps. Dimensions: 7.3" x 0.5" x 4.5"
Of course, this isn’t $50 but in Europe the pricing is higher due to one year warranty and VAT. Also, if you look around you can find better than the Fire 7 at similar price. However, it is not simply about like for like, the Amazon Fire 7 is popular as an affordable entry point for Amazon content. For what it’s worth, you couldn’t have installed the second app anyway. It was the first thing I tried when I got the tablet, starting it off with no apps and putting Antutu on it. When it got to the app store, it said that the 3D benchmarker wasn’t compatible with the tablet.